The Surrey Literacy, Scientific and Zoological Society was formed by Edward Cross in 1831 with the intention of setting up a public zoo. Cross has previously owned a menagerie on the Strand and he sold his animals to the Society who leased a 13-acre site, formerly part of the Manor of Walworth, from Lord Holland. The Surrey Zoological Gardens were laid out in 1831-2 on the land east of Kennington Park Road and north of Kennington Park. Cross built a large conservatory approximately 300ft in circumference with more than 6000 square feet of glass. (In its time this was the largest conservatory in England.) The conservatory was used for flower shows, exhibitions as well as to house animal cages as part of the Zoo. The site also contained a lake of about three acres. The 1851 Great Exhibition proved formidable competition and the zoo had become run down and by 1856 the animals had been auctioned to pay for the building of the Surrey Music Hall on the site. This was a large three-storey rectangular building with corner octagonal staircase towers topped with ornamental turrets. An arcade surrounded the ground floor with external veranda covered galleries above. The music hall was large and held up to 12,000 people. The hall was used on Sundays to hold large religious meetings some of which were addressed by Charles Haddon Spurgeon of the Metropolitan Tabernacle Elephant & Castle (and the Stockwell Orphanage). The hall was destroyed by fire in 1861 and though rebuilt it was used as a temporary hospital during the erection of the St. Thomas’s Hospital. Around 1856 the gardens themselves were popular with soldiers returning from the Crimea War (1853-56). 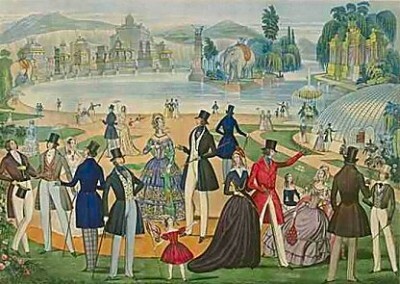 In 1862 the dramatic enactments were tried again but they failed to attract the public and although other amusements were tried the gardens eventually closed. The Gardens were sold in 1877 for building development.